Hi guys, You will find fishing reports few and far between these days as many circumstances have changed with moving to the country, running stock, entertaining a young family and of course fishing and hunting with you guys. I must admit it has been nice to sit back at night and read some other reports on the internet instead of typing one myself. 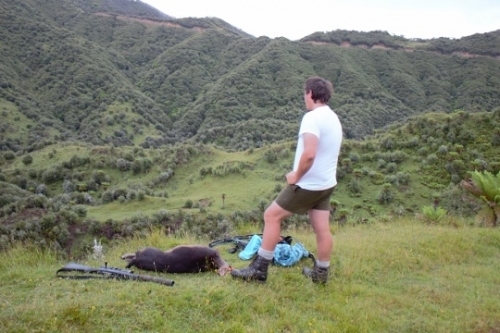 It was a huge summer season this year between fishing and hunting with record numbers of tourists through New Zealand. Guiding has been as good as ever and has shown no signs of slowing down at this end. Heading into winter is always an exciting time and looking at the booking diary most of you agree with me as I see regulars have certainly grabbed the best months with me to be fishing spawning fish locally which is great to see. I love seeing repeat work coming through the door, always great to be catching up with old friends. Im not sure what to expect this winter in terms of numbers of trout or quality but Im sure there will be hectic periods on most waters for a good few months ahead. Summer fishing this year was a mixed bag for me locally but very solid through the backcountry waters which were really opened up due to low rainfall and long sunny periods. Resident fish reacted well to all methods of angling and it certainly was a case of the more effort you stuck into your day the better the results. Walking with a day pack was always great but so was using the raft or hiring the helicopter for the day , we saw some great spots this summer. Cicadas played a big part through the warmer months as did mayfly hatches and clouds of caddis hatches at times. My favourite for the season would have to be the Mohaka- hands down this water was amazing!!! Low pressure, fat fish, eating fish and just great scenery added to this conclusion. Just last week I guided two regulars for a day trip down that way and we had an amazing day with nice fat hard fighting trout- brown and rainbows!! Taupo rivers for me this year were great up until about late January but fast became low and in many cases hard for most anglers. Fish re acted well to Cicadas especially on the Tongariro and some days it was not hard to secure 10 top feeding trout in the day but it fast came to an end as fish dropped back to the lake and were not replaced with running fish. 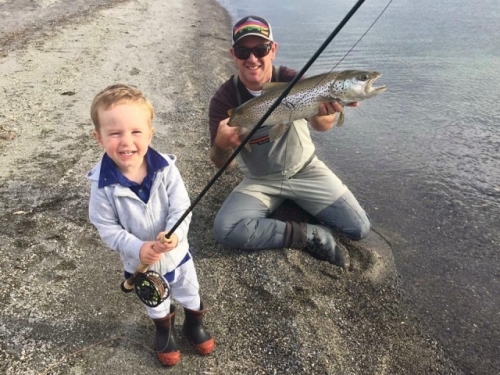 Brown trout did run the rivers and many anglers saw and caught a few in the reliable parts of the Tongariro and Waitahanui but nothing like the numbers we have enjoyed in recent years?? The Waitahanui has actually had a pretty good summer with some early running good sized jacks caught of late but also some amazing summer fishing at the rip during the day. ThereÂ is not many hours in the week which you can not see someone sitting in the rip retrieving a wet. Currently we are in desperate need of some big floods, cold westerly winds and a drop in temperature to encourage fish into rivers and kick start our winter fishing. With a busy schedule looming I am hoping this happens in the next week or so or I might be heading backcountry for a wee bit longer yet. This time last season we were seeing the first fish running in the Hine- they were stunning trout and id say the first ones will be the same again this year. Some lower reaches of the Tongariro have some small silver fish sneaking up but they are moving slow and they are quite small so nothing to be excited about just yet. 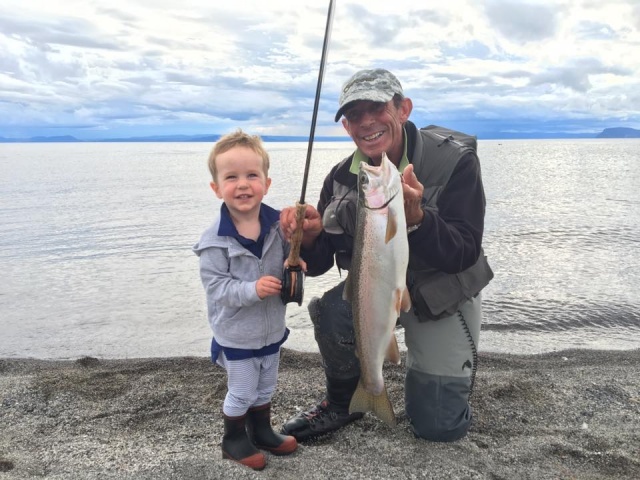 Of course the smaller rivers in the north of the lake traditionally get the best runs first followed by the tongariro right through till Nov- Dec.
Lake fishing was not as good as recent summers with small and sometimes skinny fish. Fish numbers were ok but anglers looking for a trout for the table were catching about ten before getting a trout worth killing. Why ???? I give up , gave up guessing on this one ages ago. Over the past month or so jigging has actually gone ok which is traditionally very late for this to be going well so maybe finally the food source (smelt) have made some sort of comeback. This might save the winter season for fly fisherman just in time……what’s in the lake isÂ what will be in the rivers after all. Hunting has recently played a large part in my guiding. Obviously the ROAR has just been and again it was busy most weeks with clients wanting to experience some hair raising moments up close and personal with red and fallow deer. I am lucky enough to now have two privateÂ properties to get hunters on and we are seeing many deer most days. Most of my clients are locals and clients which I have guided with trout in the past . Vern and his young fella shot 5 deer in total last week with me and in the next few weeks Derek will be trying to better that and fill the freezer for the winter months. I expect this will be something which will grow in popularity as the wheels turn ad will end up as popular as the trout fishing. If you find it hard not reading a blog everyday feel free to click into the facebook icon on the front page this will give you updates with what we have been up to that week.